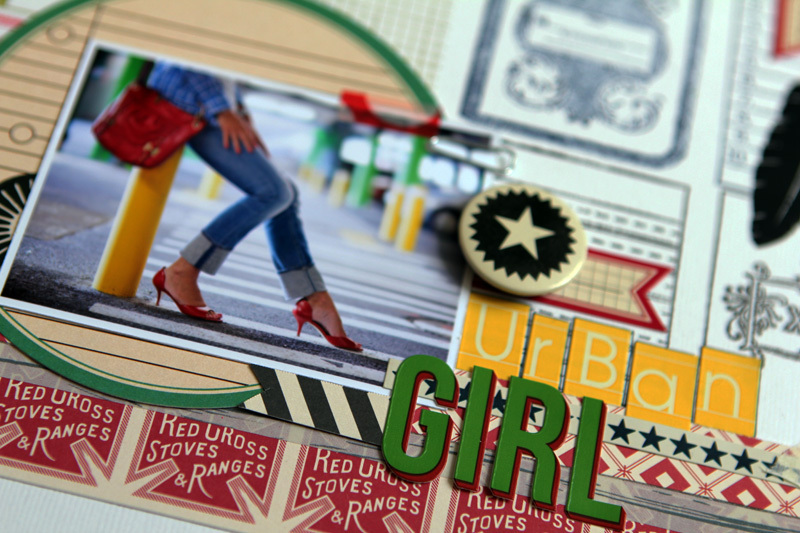 Today let me show you my “Urban Girl” layout starring the newest Jenni Bowlin Studio stamps! I tried to partially recreate a background playing with the different patterns! Here are the stamps I selected: Time Book, Grocer's List, Dictionary, and Writing Book. I chose to use 4 different ink colours as well (Versafine Red Satin for the red, Spanish Moss for the green, Black & Jenni Bowlin Spice Tin for the navy blue). 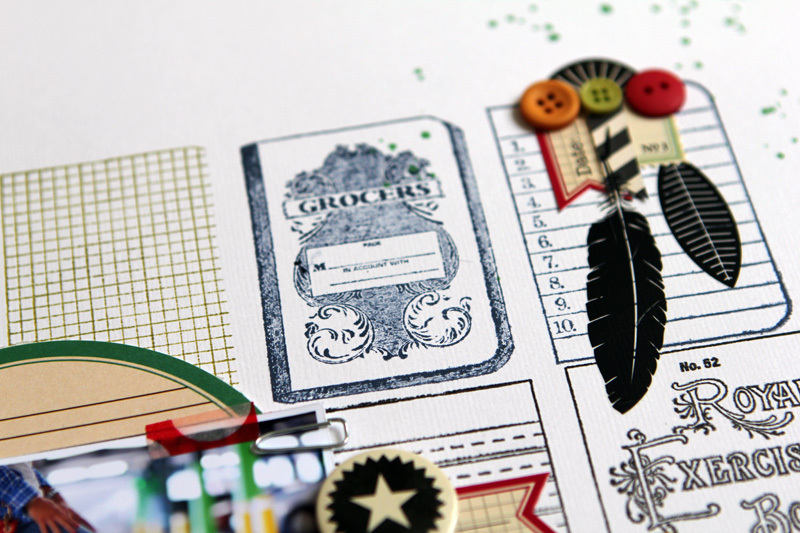 The patterns are stamped at the center of the white cardstock. Use the smooth side for a better print. Then I added 2 little strips of red patterned paper "Red/Black collection "in the frame delineated by the stamps. For a fancier note, it made sense to add a green circle. It also breaks the linear & severe note from the display I chose. 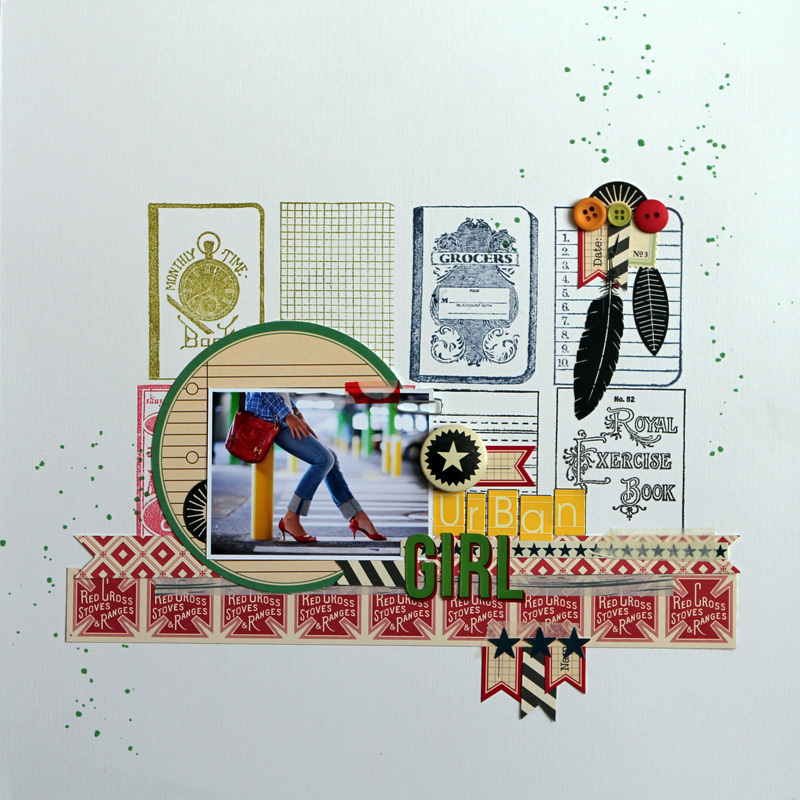 A small picture with matching colours is glued astride the circle. 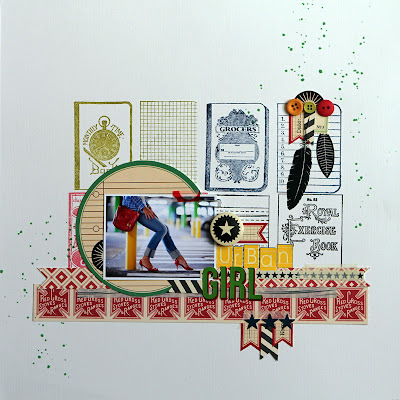 Now let’s add the title which is made here with two different Jenni Bowlin alphabets. I had fun adding accents on my lay-out such as half stickers, black feather rub-ons, stars and buttons. Last but not least, I added a badge (Icons-Flatbacks) for more volume. As a finishing touch, I splashed a few drops of green ink as a reminder of the word “Girl” and of my circle. 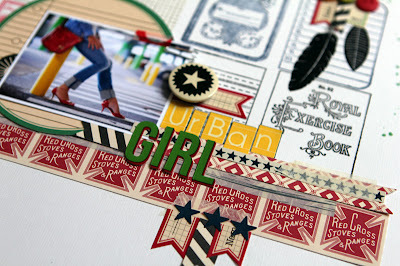 I hope you liked my lay-out and that it will make you feel like using your stamps in a different manner from now on! OOoh, I really like this! Love the way you stamped in different colours for the background. I totally need to try that. I really love this too! All the little details are stunning!